Magnum Marine’s 45th Anniversary Book, a must have for every passionate boater. If you missed it, CLICK HERE TO PURCHASE. 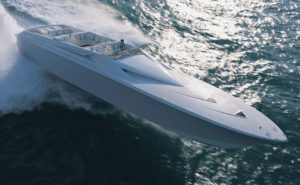 In the meantime, Boatmag International has put together a slideshow with the best photos. In order to celebrate the brand, a true legend for over 45 years, Magnum Marine issued the Magnum Anniversary Book, a fascinating 1000-copies-only volume. Through its pages, the amazing story of the boatyard since the beginning, in 1960, thanks to the guru (yet controversial) Don Aronow. Then the ownership of Filippo Theodoli, an Italian nobleman and entrepreneur who bought the yard in 1976, till the management of Kathrine Theodoli, wife of the late Filippo, since 1993. Magnum Anniversary Book has been issued in a limited edition of just 1000 copies, sold through Magnum Marine website and distributed through selected libraries in the most prestigious sea venues in the world. If you are not among those happy 1000, enjoy this gallery where you can find a large selection of those images. This story was originally posted on BoatmagInternational.com.